That said, the question was where. 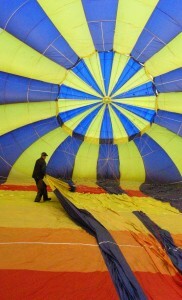 Obviously, when you go up in a balloon, you want something special to look down at. The options within the UK seemed a little routine, the landscapes to fly over too familiar and lacking in the surprise element. Egypt and the Pyramids? Had a fatal accident a few months ago. The Serengeti in Tanzania? A tad, er, beyond the budget. 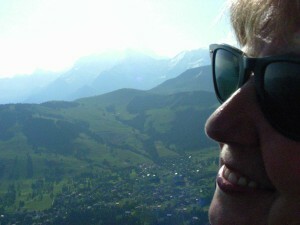 Then looking around I saw the possibility of the French Alps. 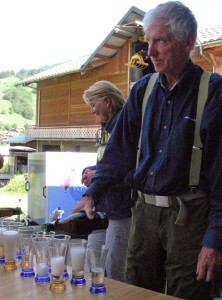 Specifically, an operation based in Praz-sur-Arly, a village a short way from Megève, a chi chi little town about 35km southwest of Chamonix and Mont Blanc. So hell, it seemed a decent bet, and I went ahead and booked up the other essentials (flights, hotel, etc). But as the date came closer the possibility that the Alpine climate could overturn the whole surprise package became a more persistent itch. The previous week weather in the Val d’Arly had apparently been glorious, sun all day and crystal clear. But as online forecasts got closer to our week they foretold black skies and storms. Though it was still too early I rang again in a neurotic search for confirmation, explaining my concerns. Don’t worry, said Erika at the office, ‘aux Alpes, les orages sont à l’aprés-midi’, in the Alpes, thunderstorms are in the afternoon. Really? OK, if you say so…. And there was indeed no need to worry, though Audrey amiably called me in England to suggest that, since we were coming a long way and she didn’t want us to be disappointed, we should bring the flight forward a day to catch the best conditions. 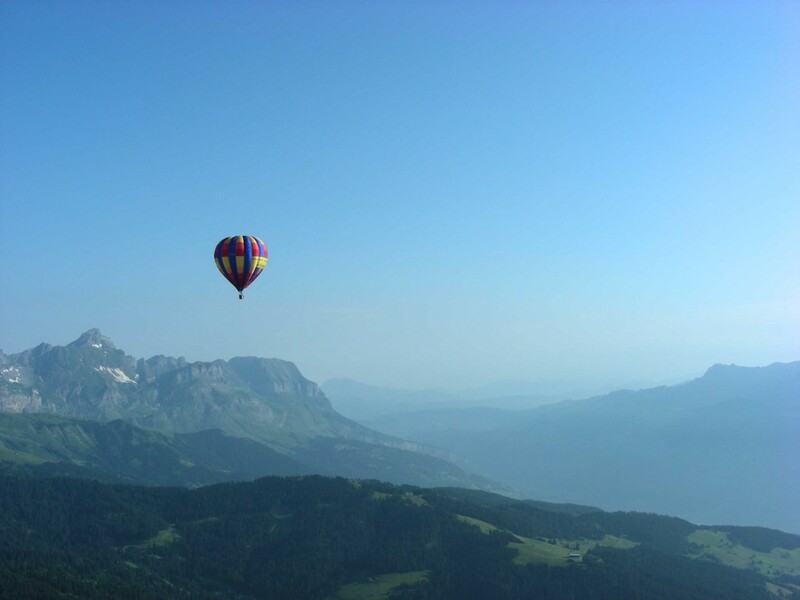 So on a beautifully bright, cool mountain morning at 7.30am we arrived in a field outside Praz to find two balloons, laid out across the grass like long, tangled, multi-coloured bedsheets. The sky was brilliant blue and thundercloud-free. And there we met the pilot of our balloon, Jo, a tall, spare man in his 60s with a drily French sense of humour, and our fellow passengers, all like us first-time balloonists: a very quiet elderly man from Praz village who said he’d often seen the balloons and finally decided to go up himself, and an almost as quiet married couple. We later found out that the man, Hubert, suffered from vertige, vertigo, and was only going on the flight to keep his wife company, which, given the impression he gave of being on the verge of a major panic attack, seemed frankly mad, and a sacrifice a little too far. Jo and the rest of the crew set about preparing the two balloons, breathing warm air into them first with huge fans, and then gas jets. At first they seemed not to respond, but then began to take shape and rise up out of the field, like giant, bulbous tents. And then, almost of a sudden, they swelled into fully-formed balloons and lurched into the air, jerking upright the baskets underneath them. Then we all climbed in, cast off, and rose rapidly above the village, as Jo, who passed on that ‘j’adore le météo’ (‘I adore meteorology’ doesn’t really catch the same degree of quiet enthusiasm) told us a great deal about how balloons work and why it’s important to start early to catch the cold air, which we appreciated, even though he left our French vocabulary some way behind. And then, as we reached about 2,500 metres, there was to our complete surprise almost no wind, but only the lightest of soft breezes that scarcely touched against us as we hung in the air above the valley and a superb ring of mountains, with Switzerland and Italy away in the distance. A world that had seemed potentially precarious and hostile suddenly appeared completely safe, welcoming, restful. 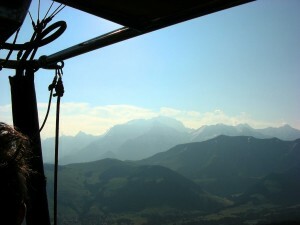 Away to the east and still above us was Mont Blanc, vast, hulking and immobile, as we felt immobile in the sky. 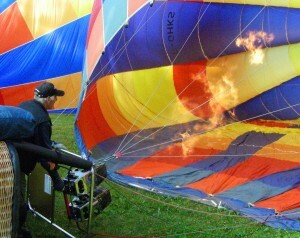 Balloon-flying is not a uniform activity. Jo was a fairly conservative pilot (perhaps in response to occasional winces from Hubert, we were never quite sure), apparently content to float straight up, and then move along the valley as gently as the breeze took us. The pilot of the other balloon seemed much more active, staying low to catch a current and floating along the valley floor surprisingly quickly before abruptly rising way above us, to 3,200 metres. The furthest they go in ground terms in these flights, we were told, is around 30km, but we scarcely did more than five. 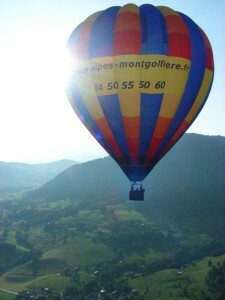 After about an hour’s gentle wafting Jo manipulated the top of the balloon and the gas jets to bring us down in a field on the edge of Megève, where the farmer, his grandchildren and the van to take us back to Praz were waiting for us. This was one of their more regular landing spots, but, I asked, they must land all around the valley… ‘Oh yeah…’ the van driver said, a few days ago they’d come down in a forest, and he’d had to struggle to get the van down a dirt track to the balloon… All part of the fun. Then we all helped to get the air out of the balloon, pack it up and push it into the back of the van, and waited for another van with the passengers from the other balloon, who seemed to have landed miles away. 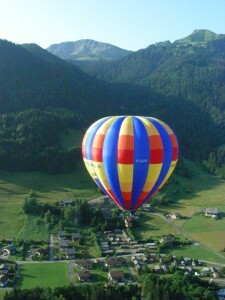 And once everyone had turned up, Jo finished the trip and saluted all us nouveau-balloonists with a toast in the farmyard, with some very decent champagne and – a curious choice of aperitif – homemade chocolate cookies. Santé! A few hours later, after lunch, the skies opened in one of the most magnificently operatic, torrential, air-freshening mountain storms you could ever see. Erika had been exactly right. We live in Northern Italy with the Dolomites in our backyard. It does indeed thunderstorm daily, but not until the afternoon. What a nice birthday present! I’ve always been infatuated with hot air balloons. My husband and I were even married in one, though bad weather kept us grounded. It’s been 11 years and we still haven’t taken a hot air balloon flight together. Hopefully this year finally! Hope you get there. Just be flexible about the timing….